August rolled in at TechHub Bucharest packed with interesting events, such as Open Space on Technology for Startups, hosted by Adrian Bolboaca from Mozaic on a hot middle-of-august Saturday. 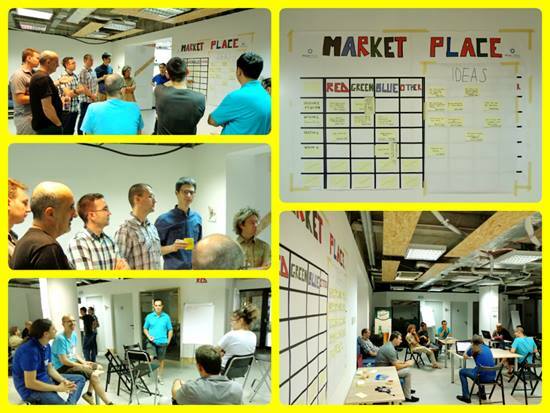 As this was the first Open Space event here at TechHub, we were very curious to see how it would unfold! The event�s main purpose was to offer its participants information and networking through open discussions (like �a well-managed conference coffee break�). There was no set schedule. The topics discussed were chosen by those attending, thus keeping the interest level high through-out the event. We particularly liked the wide array of topics, ranging from building a Minimum Viable Product (MVP), Crowdfunding, Marketing, Cloud Computing and Lifecycle apps. Participants enjoyed engaging in (or just observing) different conversations: �It was fun because many times the discussion flowed towards common topics, adjacent domains� and this way, you never know who you�re gonna meet, connect with - maybe he�ll be your next startup partner� said Cristi, one of the participants. We can�t wait to see what the next Open Space on Technology�s gonna bring at TechHub! For more pictures from the event, check out our Facebook page!